Animals often end up where you would not expect them to be. 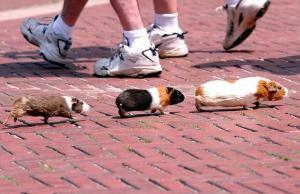 I would love to see a little guinea pig parade! Luckily these three were soon intercepted by their owner and saved from the dangers of being free in New York. This is a picture taken during the shooting of a Maybelline commerical. Finally, you never know what you will see at the store! 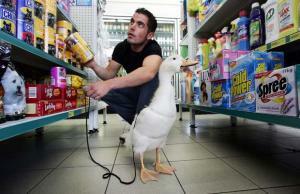 I have never seen a bird on a leash before, but he is a cute duck! This is Hector, he lives with his owner in Australia. To see more unexpected animal pictures, visit the article Urban Animals: Unexpected Animal visitors to the World’s Urban Jungles.